Virtual reality’s renaissance is now a little over a year and some months old. The 2016 releases of the Oculus Rift CV1, HTC Vive, and some say the years earlier release of the Google Cardboard, spawned a frenzy of speculation about the future. Education is a realm that is no stranger to the lures of new technology and was quickly picked up in the VR hype wave. That wave is still rolling though I’d say it has plateaued. If VR is really to be a meaningful advance in the education field, it must have a solid foundation upon which to mature. What most people don’t realize is that VR’s renaissance is one in the truest sense of the word. Currently, we are experiencing a rebirth of interest in VR technology that already had its “up” and a quite drastic “down”. Even though VR had dropped from the public’s attention for decades, academic research kept it alive. My purpose in this post, and the larger purpose of this website, is to illuminate the past and present research findings that are solidifying VR’s place in education. In his 2016 article, The Information Age is Over; Welcome to the Experience Age, Mike Wadhera alluded to our society’s emergence into a new way of living. Instead of expressing ourselves and learning through static information updates, we now communicate in much more dynamic and spontaneous ways. VR is a tool that epitomizes the idea of sharing one’s experiences with others and learning about their own experiences. It could be the next breakthrough in educational technology. However, the field of education often lags far behind when it comes to innovations and I think that is a good thing. There is too much riding on education (especially public education) to be chasing the fleeting developments of technology. Due to political reasons, education does not have the freedom to waste trillions of dollars in wrongful, fantastical pursuits like our military. However, there is evidence that VR can provide solid benefits to educational challenges in the Experience Age1 . In particular, VR can: lead to increased student engagement; provide active, constructivist learning; increase frequency of authentic learning experiences; allow for empathetic experiences; enable students to exercise creativity; and provide an arena for visualizing abstract concepts concretely. In future posts I will back up each of these claims. For now, let’s begin with the most obvious. Several characteristics of VR provide an opportunity to boost student engagement. As a hands-on, interactive, immersive experience, it provides a novel way of learning for students, delivering powerful new experiences they may not have encountered before2. 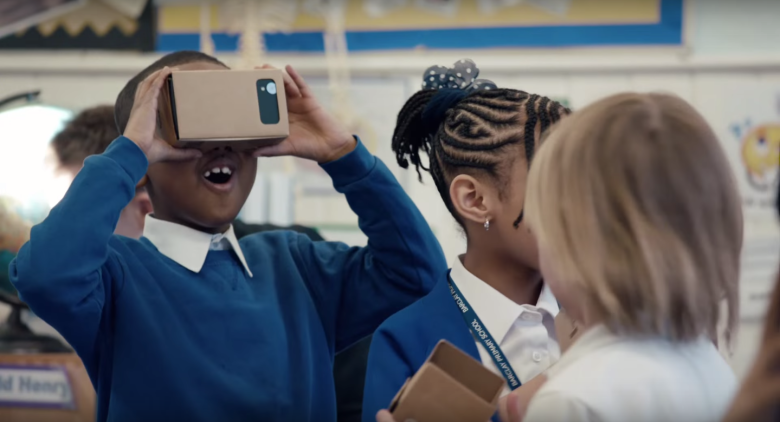 For example, Google Expeditions allows teachers to transport students to virtual field trips to Mars, the bottom of the ocean, and many other settings, which can spark new interest in subject matter, provide a shared experience for better classroom discussion, and improve overall engagement3. Experiences like these provide unique and fresh learning moments that draw in students and pique their interest as they actively explore and exercise their curiosity. This increased engagement can be an opportunity for addressing typically boring or low appeal subject areas. For example, Costa and Melotti (2012) found that VR exhibits increased interest in archaeology, especially where interest was low in the past. The novelty and entertainment value of VR can be used strategically to draw in the attention of lost and disinterested students, including in subjects that some students may usually find boring or irrelevant. From there, VR-specific pedagogy, which will be discussed later, can maximize the learning potential of these experiences. VR also boosts engagement by providing students with a strong sense of presence and immersion compared to traditional learning environments4. Different kinds of classroom experiences have varying levels of presence: reading literature in a classroom; passively watching videos; watching performance theater; performing itself; and the most interactive, actually embodying actors and objects in VR5. By enveloping a student in an authentic, multi-sensory experience, VR makes a subject area come alive. For instance, students have the opportunity to navigate inside the human body’s bloodstream as a red blood cell in The Body VR. The ability to simulate an environment and increase a student’s sense of presence is one of the most important opportunities of VR to create more engaging educational experiences. With the student engaged and interest piqued, the other affordances of VR can now come into play. To read more about VR and constructivist learning, click here.